On the whole society is content with the notion of “do the crime: serve the time”, but what happens when that time is served and the individual is released back into the community? Do we welcome or exclude? Are we satisfied that a lesson has been learned, or are we concerned that the individual will re-offend? Do we want to understand the problems they face on release, or would we rather brush those issues under the carpet? The story of a former prisoner is about more than the offence or offences they have committed, and the punishment that has been meted out to them as a result. Many come with difficult back stories that begin in childhood: of neglect, abuse, an unstable family life, experience of poverty or need, a lack of engagement in education, the sense of being failed by society as a whole. According to statistics from the Ministry of Justice, published in July 2013, almost a quarter of all prisoners (of a prison population of more than 85,000) had lived with foster parents or in an institution, or had been taken into care at some point in their childhoods. More than 40 per cent had seen violence in the home as a child, and almost two-thirds had at some point been temporarily excluded from school – more than 40 per cent had been permanently excluded. It is probably too simplistic a correlation to link such difficulties in childhood with a propensity to offend, or to an increased risk of mental health problems, but the cause is clear, even if it does not hold for all. Little wonder then that the last Office of National Statistics survey to cover the issue showed that 64 per cent of male sentenced prisoners, and 78 per cent of men in remand, had a personality disorder. Other problems such as depression and anxiety, were also comparatively high: 40 per cent in male sentenced prisoners and 55 per cent in males on remand. For women the figures were higher still: 63 per cent and 76 per cent respectively. 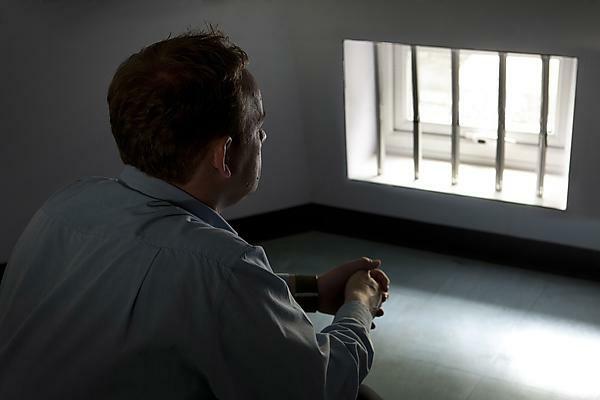 Prisoners have a high prevalence of mental health problems. Rates for various mental health conditions as a whole, range from 50 to 90 per cent. Prisoners released from prison with mental health problems face difficulty with family relationships, employment, long-term illness, self-harm, depression and re-offending. And re-offending is an issue. Those most likely to re-offend are prisoners who have received sentences of one year or less – nearly 60 per cent of those leaving prison. Such individuals are so-called ‘revolvers’ or ‘churners’ – frequently in and out of prison. Their lives revolve between chaotic existences in the community and spells in custody. As such, often they are not under the supervision of probation services, neither do they have meaningful contact with primary care or specialist mental health services before or after release. It is this group which is most at risk of re-offending and of causing themselves harm. The age-adjusted risk of suicide for male offenders leaving prison is eight times the national average, and over a quarter of fatal suicide attempts happen within four weeks of release. Almost a quarter of all deaths under Probation Service supervision are catalogued as suicides, often by violent means. My first research related to offenders documents their stories of suicide attempts. Clearly, something needs to be done before and on release to provide former prisoners with the support structure necessary for them to rebuild their lives in a meaningful way, become part of society and turn away from re-offending. This issue, specifically with regard to former prisoners with mental health problems, has been the focus of a core of work carried out by our team at University of Plymouth's Faculty of Medicine and Dentistry, together with other organisations around the UK. Our initial study, Care for Offenders: Continuity of Access (COCOA), was the first such to systematically examine healthcare received by offenders across the criminal justice system and was published in 2012. We concluded that existing service configuration along with individual’s attitude and lifestyle both contribute to poor on-going access to mental health support. So in 2009 we asked ourselves the question: what would need to be done to help recently-released prisoners re-enter society successfully and break the cycle of mental illness and re-offending? The findings from COCOA and pilot work to show we could successfully follow up prison leavers led to funding of £2 million from the National Institute for Health Research (NIHR) Programme Grants for Applied Research (PGfAR) to carry out a five-year programme to develop and evaluate a system of care to address the problems of obtaining mental health care on release. We also received support from the NIHR Collaboration for Leadership in Applied Health Research and Care South West Peninsula (NIHR PenCLAHRC). The project aims to develop and evaluate a way of organising care based on an integrated approach involving therapy, medication, housing, training and employment, and ensuring that care continues after release. We are currently coming to the end of phase one, which has seen researchers working closely with people who have previously been in prison, the prison service and community care providers, to develop the model for an integrated approach to identify and engage prisoners before release and then set up and deliver care after release. The approach will be tested, and elements of it ‘road tested’, to ensure the best chance of benefiting prisoners. The academic research team are working with eight local men who have served prison sentences. As ‘peer researchers’ these men contribute their life experiences to the research project. The group has been able to use their experiences of being in prison, and of the challenging times they experienced when they were released, to support, inform and even challenge the research team. They have worked alongside the academic researchers to develop the proposed system of care, and advised on how best to phrase the written materials that participants will be given. The peer researchers have met with the academic researchers fortnightly since the autumn. They have helped to run and interpret focus groups by communicating with other ex-offenders in ways in which they feel comfortable. They have ensured that the researchers are producing results that work in the real world for people with similar experiences to themselves. They have also contributed to how, and what, those taking part can do for themselves to build on their own skills and strengths. The result is a matrix of activities that we believe will make a real difference. We start eight to 12 weeks before release to work on what we call “shared understanding”. This includes two meetings between the soon-to-be released prisoner, their supervisor and practitioner, where we really get to grips with what links thinking and emotions, behaviour and social outcomes for that individual. For example, they may have an established cycle where, on release, they become anxious, deal with that anxiety by becoming angry and end up getting into trouble. Conversely, anxiety might result in them not wanting to go out. They might just want to get rid of stress, or simply find a job – goals and objectives are different for each individual. We then move to the “shared plan”, where we mobilise the resources that already exist and are available to address the needs identified during the shared understanding stage. This may involve GPs, friends, family and organisations such as the Citizens Advice Bureau and employment services. We work through the shared plan while the individual is still in prison so that support is available on release and ‘through the gate’ challenges are addressed (for example, avoiding the individual heading straight for the pub or their dealer on release). This is then taken forward as action in the community, where we help the individual to re-engage with the community, review their plan and set up working arrangements. The individual is given a copy of their plan so that they can share it with all the various practitioners (health, social, employment, etc) they will engage with on and after release. The second phase will be a randomised controlled trial in which half the prisoners would receive this new approach while the others would receive the care that is usually available – very little. By collecting information related to people’s health, the healthcare they have received, improvements in their social situation (including housing and employment) and their involvement or otherwise with the criminal justice system, we can evaluate the effectiveness of the new integrated approach by comparing it with the results achieved by the usual system of care. As well as investigating the benefits to released prisoners with mental health problems, we will also assess economic impact to see if there could be savings to the public purse. Will we change society’s attitudes to the ex-offender? Only time will tell. But we are confident that we are laying the groundwork for a revolutionary new way to support prisoners with mental health issues when they are released. This has to be of benefit to them and, ultimately, to society as a whole – improved lives, better integration into society and a reduced risk of re-offending. And remember, former prisoners are not so ‘other’ – they are people who live all around you. Key to ensuring that the work carried out in this area by the University of Plymouth's Faculty of Medicine and Dentistry's effective and relevant, has been the input from men who have been through the prison system, so-called ‘peer researchers’. Two such peer researchers are Steve and Julian. Julian had a sad event in his life. In order to help ease his grief Julian turned to drugs, and shoplifted to help fund his need. He was sentenced three years ago for shoplifting. Steve was sentenced in 2009 for supplying heroin. During his time in prison he received one half day session on relapse prevention and no help for addressing the emotional issues that led to his conviction. Julian and Steve were joined on the project by research peers Chris, Cliff, Lee and Eddie, and others.